This is a sponsored post. See bottom of post for full disclosure. I don't know what I've done. I didn't blow my nose on a tablecloth. I didn't leave a 5-cent tip. Somehow, I've offended the restaurant gods, as my run of bad luck continues. The curse's latest incarnation was at one of Gordon St's Indian joints, where a nothing-special entree segued to just-okay mains. 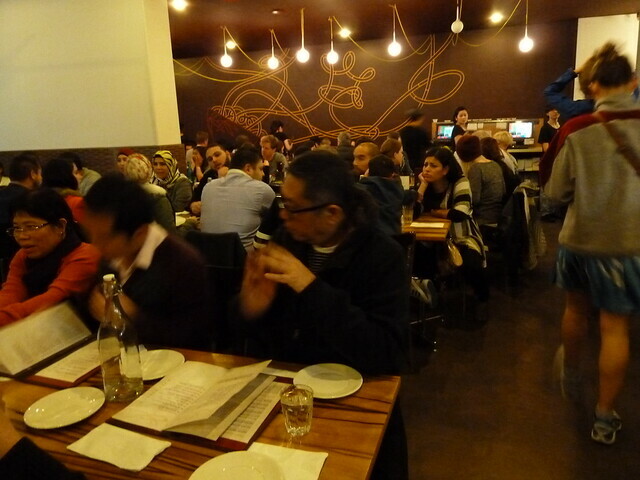 At least we enjoyed the naan - until, under the napkin lining the basket, we found an old chicken bone lurking. I'm not making this up!!! 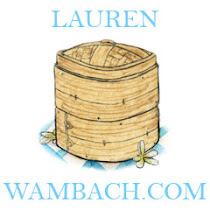 So I knew that when this blog post had a deadline, there was no time to go sailing into unchartered waters. I needed something truly time tested. Enter Laksa King. If you don't already know the story, Laksa King used to be a tiny hole-in-the-wall joint in a dingy arcade. 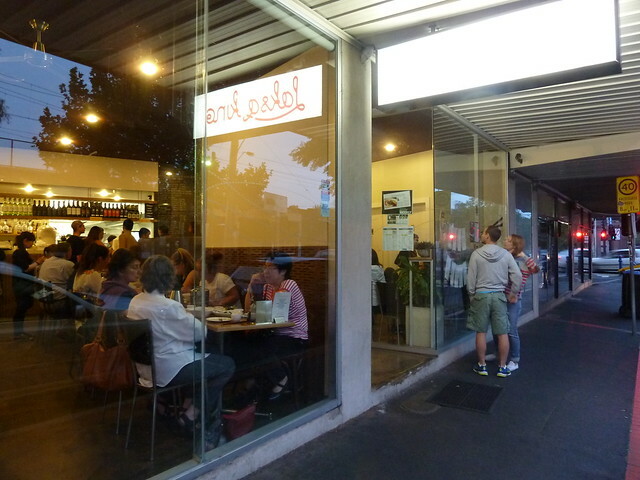 They did a cracking laksa. I have no idea what the rest of their food was like, and I don't think anyone else did either - you ordered the laksa and that was that. A few years ago they moved around the corner and underwent a massive transformation, from tiny storefront to the big, glitzy shebang that it is now. There was a lot of argy-bargy at the time about whether or not it had gone downhill, and I really can't comment, as I never went enough to perceive any noticeable difference. 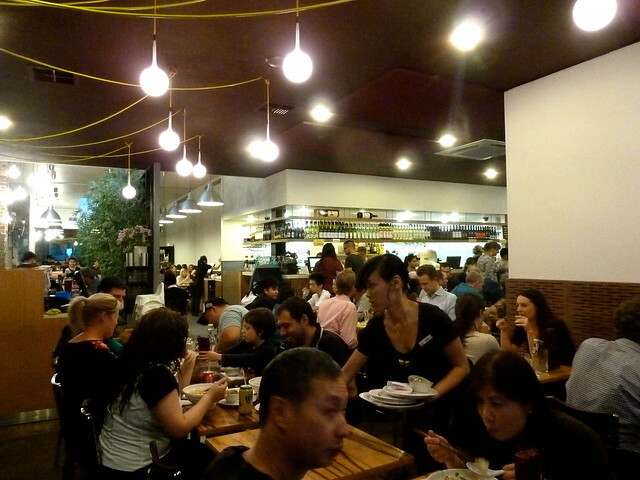 Since then, though, it's become one of my favourite places for reliably delicious Malaysian food. 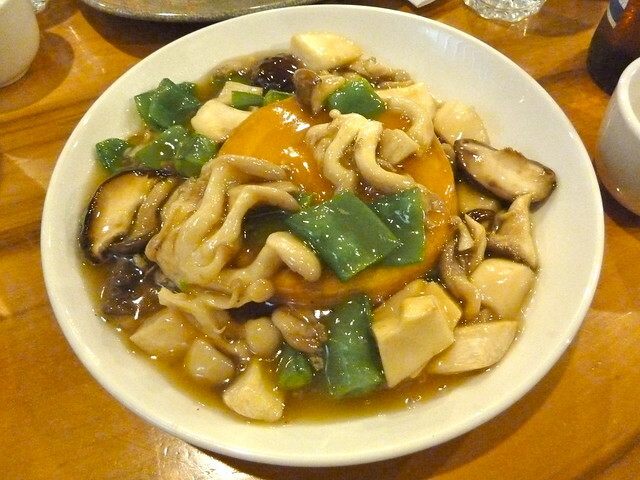 Loved this homemade tofu with mushrooms ($15.80). The tofu was awesome - a big, wobbly serve, almost like a savoury pudding. It was deliciously rich with an almost eggy taste - really not like the usual blandness folks associate with tofu. And on top, loads of interesting mushrooms, from little clawlike clutches to nice meaty pieces of shiitake. Well, with something so healthy, of course we had to have something OTT. I know these wasabi prawns ($20.80) aren't very Malaysian but hoo boy, they were good! 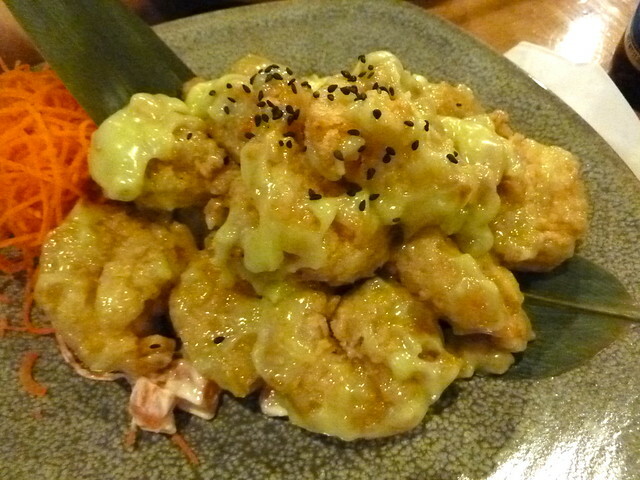 The prawns were really big and bouncy with crunchy batter and sweet, only slightly hot wasabi mayo. Given the quality of the crustaceans, it's good value, too. 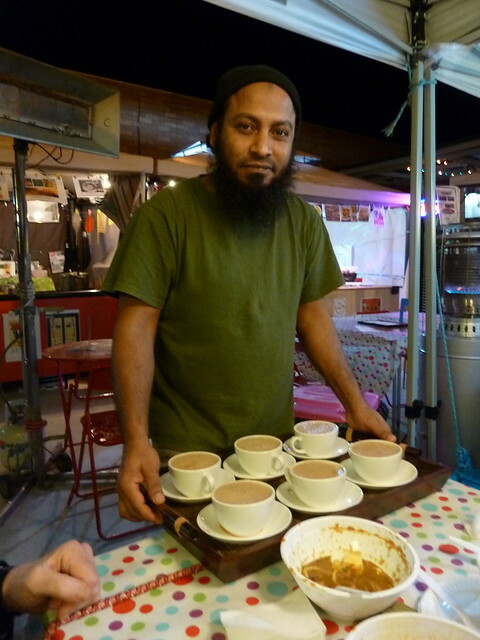 Here's a few highlights from other Laksa King voyages. This was a chef's special, and the second time I had it, it wasn't on the specials menu but I asked if they could make it. 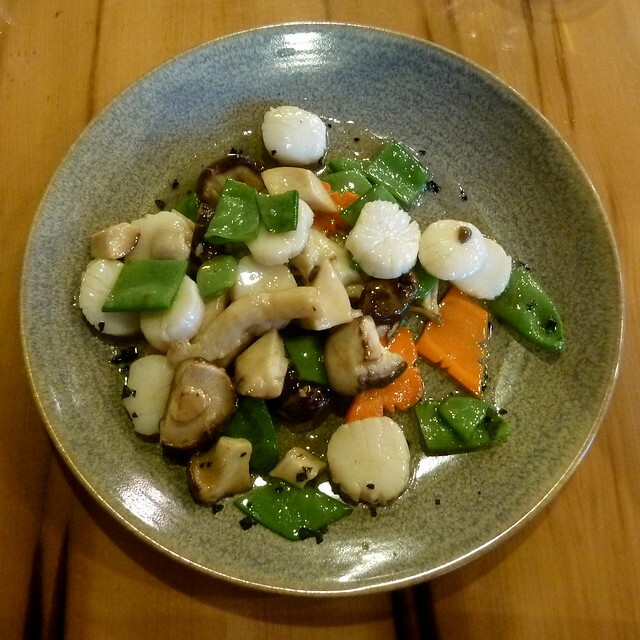 It's scallops with veg and "volcanic salt" - big crystals of smoky, rich, black salt. I love this dish. Try asking and perhaps you shall receive! 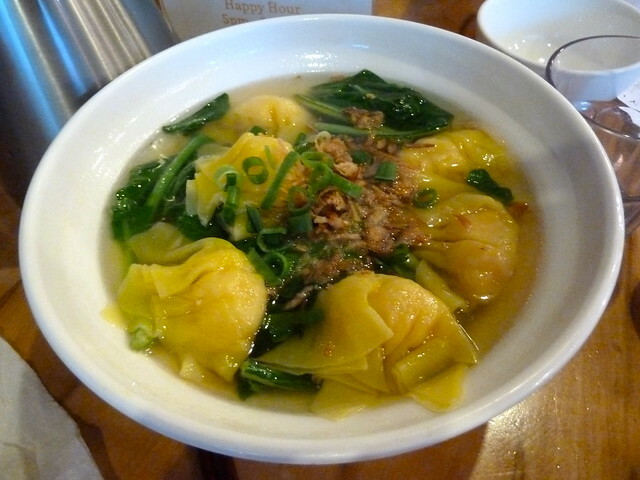 This is what my kids usually share between three - prawn dumplings with egg noodles ($10.80). The stock is tasty and if not MSG-free, then very low. Lovely dumplings, few token bits of veg - perfect. 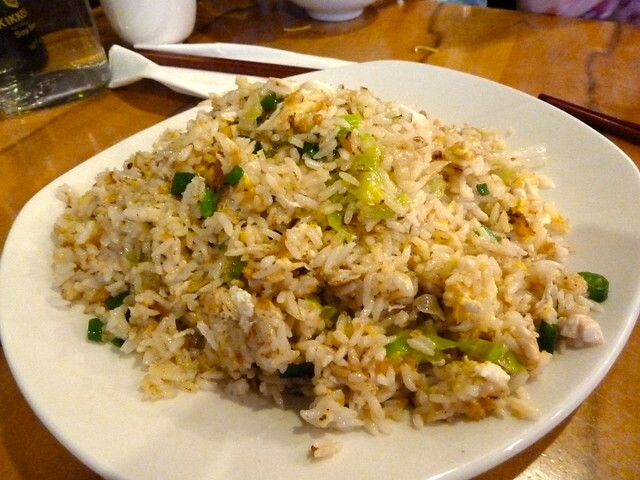 And yes, it's the old Baklover standby - salted fish and chicken fried rice ($11.20). Don't order that stuff with peas, carrots and BBQ pork - give this a try. You don't need anything else on the table, it's that good. So if you feel like you're on a losing streak - restaurant-related or otherwise - head to the King. I guarantee you'll come out feeling like a winner. This is a sponsored post for the Australian Mushroom Growers' Association "Mushroom Mania" campaign. 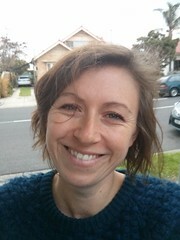 In their own words: "Each July Australian Mushroom Growers run a foodservice campaign called Mushroom Mania. The campaign rolls out throughout Australia and encourages the community to eat out in July, to enjoy healthy mushroom meals." I was paid a flat sum for my writing which did not include meal expenses. I was free to choose where to eat and the restaurant was not notified before nor after about this post. Australian Mushroom Growers and Laksa King have not sought nor been given any editorial control of this post. They say to discover new lands, you must lose sight of the shore. My friend J has recently become my devoted culinary co-explorer. Rather than bloated merchant seaman buffeted by the Urbanspoon tradewinds, we're like rangy pirates, plundering every backwater and secluded cove for obscure comestible treasures. Recently, though, we've had a run of bad luck. 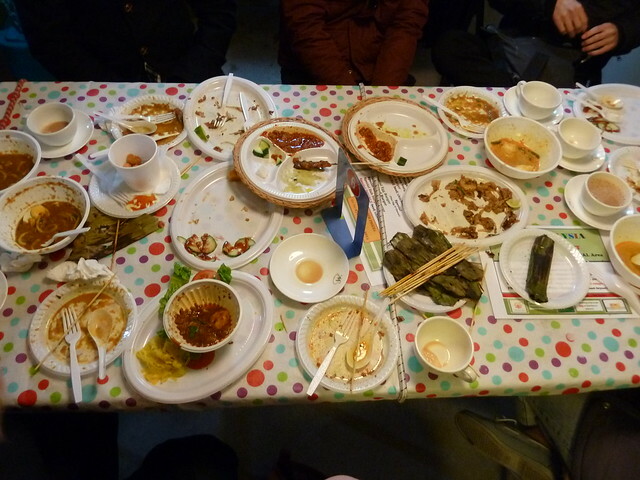 There was the hipster Korean that ravaged our wallets but failed to put any wind in our sails, and elsewhere, the tofu, chicken and salted fish dish that didn't just look like what the cat dragged in, but something it dragged in, mauled, gnawed on and threw up. We ended up huddled in the lee of Nhu Lan, gnawing on our emergency banh mis, quite lost for words. So I knew that when I sent that next text - "fancy trying X next Thursday night?" - that X had better not just mark the spot, but bloody well hit it. Enter Two Birds' Nest. But these birds have chosen to feather their nest even further by letting Casey Wall curate the menu. Casey is one half of Rockwell and Sons, which is one of my top reasons to cross the river. He's a North Carolina native who's done time at joints as fancy as Le Cirque in New York and Cutler & Co in Fitzroy. In the case of Rockwell, this translates to rib-sticking American goodies like fried chicken or devilled eggs, done with care and panache. 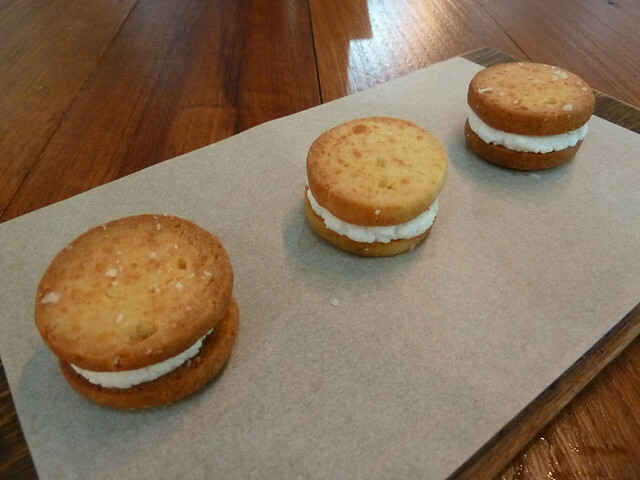 We pulled up a stool at one of the communal tables and got nibbling on Parmesan shortbread and goats curd Oreos ($9), which were brilliant. Regular Oreos go great with milk, and these Oreos go great with beer. 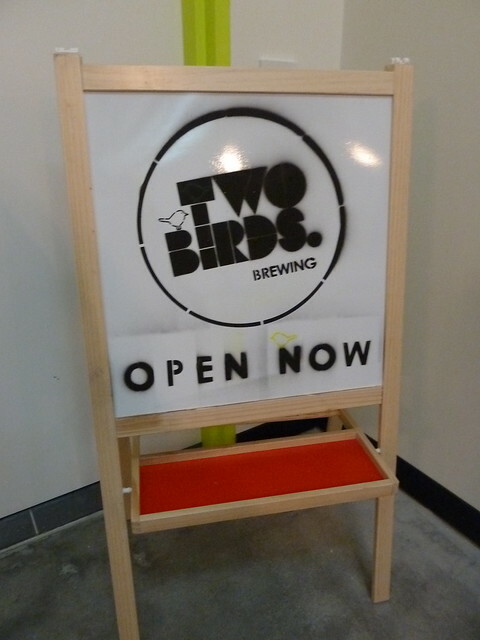 Here at the Nest, you can sample Two Birds' own brews plus guest taps, and there's wine and boutique spirits, too. 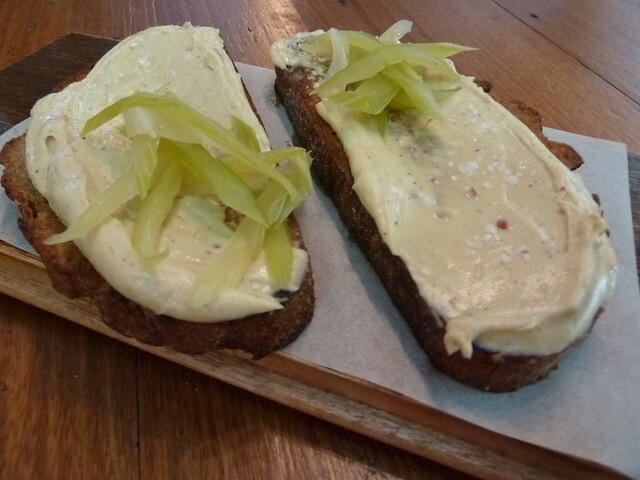 We swooned over this Kentucky beer cheese on crisp, well-oiled rye bread slices ($12). This stuff was incredible - a blend of Vermont cheddar, cream cheese, Sunset ale and spices to make a gooey, bitey spread that was totally amazing. There are four sandwiches for mains. We're talking what Casey calls the world's greatest grilled cheese, with bacon jam and smoked scamorza cheese, or a very interesting proposal with pressed broccoli and vintage cheddar. 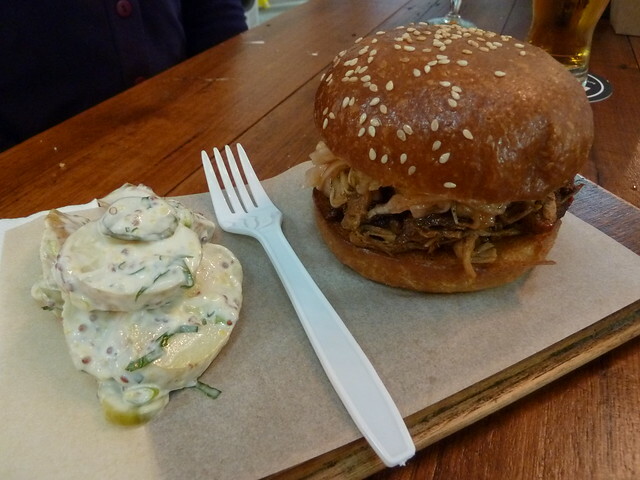 But today it had to be the smoked pulled pork with red slaw ($16). I know every man and his dog is doing pulled pork these days, but this is the real deal. You have to try it - it's out of this world! 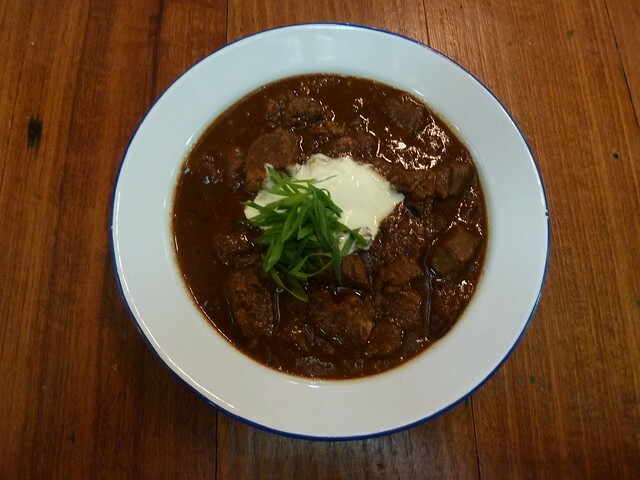 It was the brisket-and-bacon "5-Chile Chilli" for me, topped with a little house-made creme fraiche ($18). Rich, dark, spicy and fabulous. This 'un is perfect with the "Taco Beer", which has been brewed with a little corn, plus a sprinkling of lime and coriander! I could definitely taste the corn, which gave it a fresh, popcorny spark. Yum. 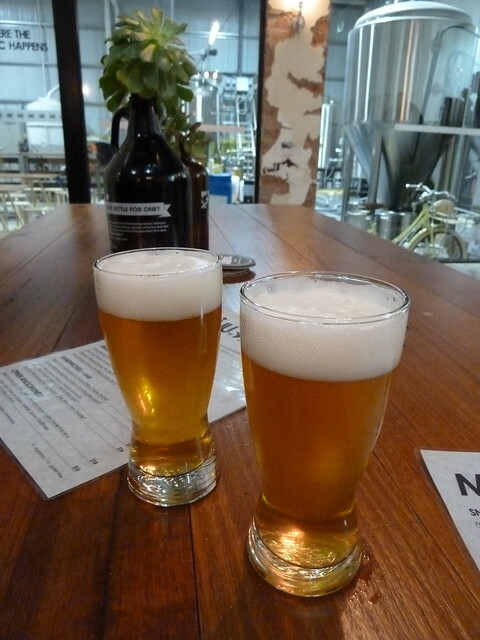 Two Birds Nest is just a few hundred metres from Spotswood station, or if you accidentally get on an express like we did, you can also easily walk from Newport - it's a ten-minute stroll. 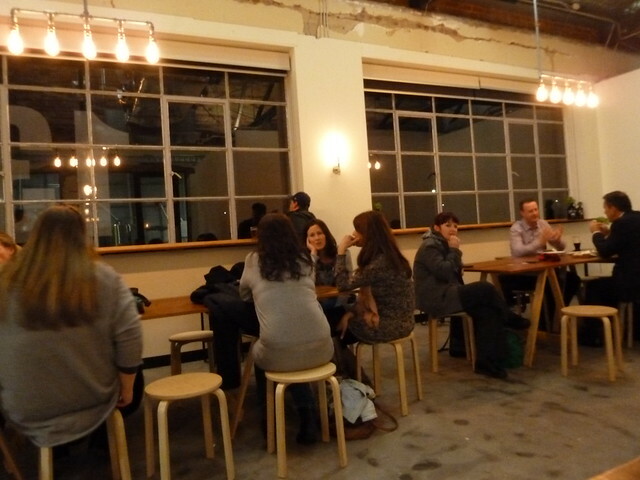 There are more seats in the actual brewing room. Another specialty on the menu that we didn't try is the cheese platter, with matched beers - there's even a proper cheese cabinet so every wedge is at the perfect temperature. So if like us, you navigate the world by the tum, Two Birds Nest isn't just safe harbour. In terms of your tastebuds, it's like docking at Rio when Carnaval is on. Set sail on the good ship Metro and come and visit! Read more here at The Crafty Pint, or cop a sneaky peek at the current menu here! Open: Thurs 4-10pm, Fri 4-11pm, Sat noon-11pm, Sun noon-10pm. So Ethiopia has thirteen months of sunshine, or so the poster on the wall tells me. Yet when the winter chill sets in here in Footscray, it's the food from this land of eternal summer that I start craving. 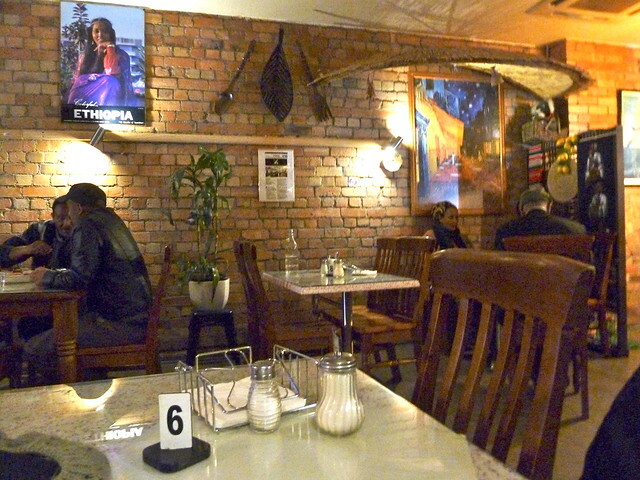 The poster in question is on the wall here at Ras Dashen, just one of Footscray's Ethiopian eateries. It doesn't look much from the outside - indeed, you might wonder if it's even open, it looks so dark - but I highly encourage you to step in. We ordered the vegetarian combination which is everything you see (bar the pot in the centre) for a rather staggering $10. Red and brown lentils, beans, cabbage and carrot...all delicious, albeit rather unusually served room temperature. 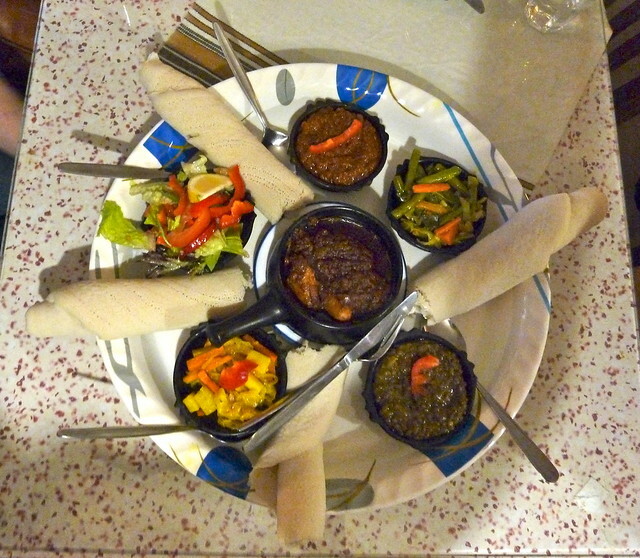 In the middle was our order of doro wot ($10), chicken pieces cooked in an intense, deep maroon sauce made with very slow-cooked onion and berbere spice. It wasn't crazily loaded with chicken pieces, but it's the sauce that gets me going more than anything. The prices are pretty fabulous. If you want a good intro, I'd get the veg combo plus number 5 (the Misto - two different mincemeat curries). Maybe add in a doro wot if you've got three people dining, and a tibs if you've got four. I like to think of tibs like stir-fries - they're a bit drier than things with "wot" in the name, which tend to be wet and saucy. 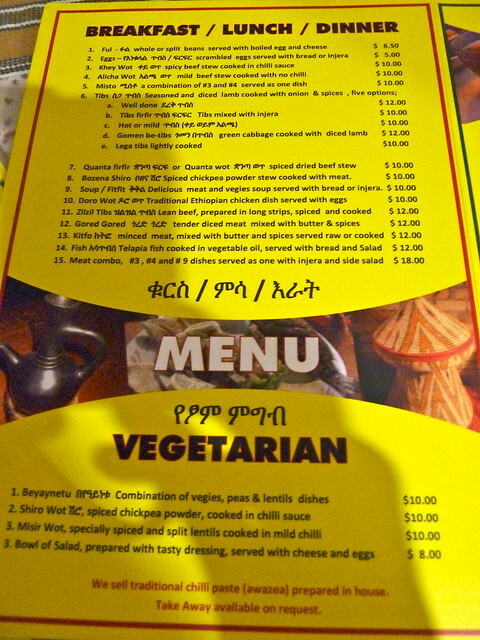 You might look at an Ethiopian menu and think it all sounds the same. I can remember going to a Mexican restaurant in the US for the first time 10+ years ago and reading "tortilla, sauce, cheese... tortilla, sauce, cheese..." It all sounded like exactly the same dish reworded 20 times. Obviously I couldn't have been more wrong. Keep experimenting, ordering, trying and you'll soon have your favourite dishes locked down. 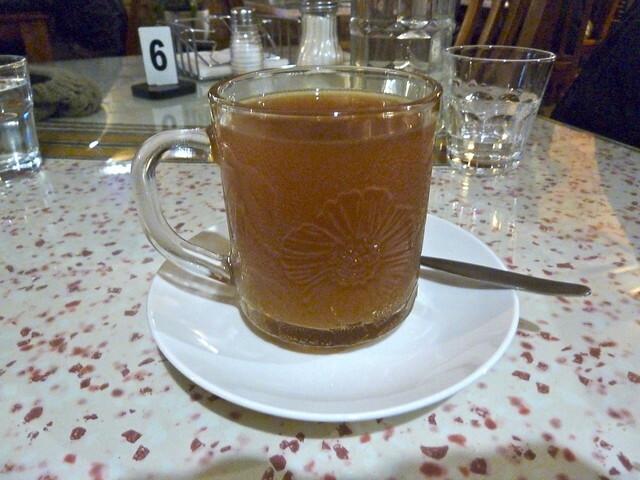 I do rather love the ginger tea served in many of Footscray's African eateries. It's super spicy, sweet and delicious. Like nearby Konjo, Ras Dashen will do traditional Ethiopian coffee without the whole ceremony (other places usually reserve it for large bookings and charge quite a bit of money). 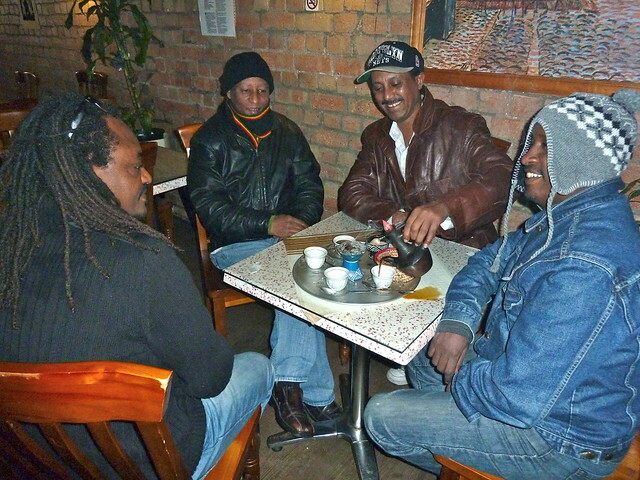 Love that they still serve the jebena (pot) along with the traditional incense. I've got a post brewing (get it?) about Konjo and Ethiopian coffee, so stay tuned to learn a bit more about this tradition. 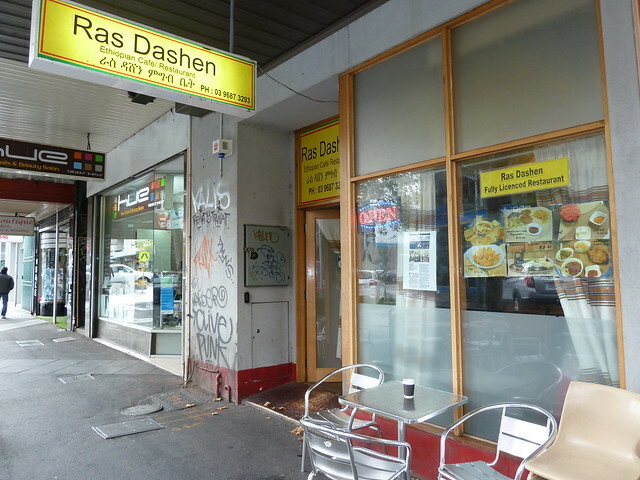 And while we're on the subject of bad puns - Ras Dashen. Dash in! As I tugged on my uggs, I was waiting for that call. As the wind howled outside, I was waiting for that ding. I had invited six fearless foodies to join me at an outdoor "hawker centre" on the windiest, most bone-chilling Friday night of the year. It is a testament to everyone's total devotion to the tum that not a single person piked! MiHUB in Werribee has been on my radar for some time but it was a tip from reader Sukie that pushed it to the front of the queue. She wrote telling me of "an outdoor Malaysian hawker centre... We went for the 1st time last night and thought I was back in Asia from that first whiff of the air. 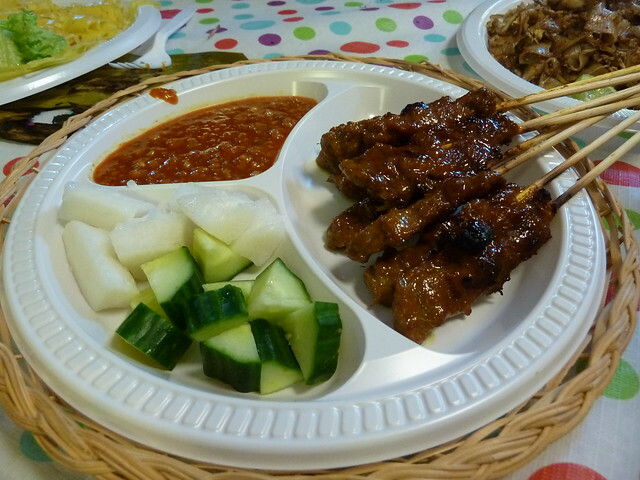 Satay skewers, nasi lemak, mee rebus, char kwe tiaw, little Malay cakes". Now, if that does not make you excited - you need to check for a pulse! According to the Star, Werribee's Migrant Hub was started by Walter Villagonzolo, a migrant from the Philippines. 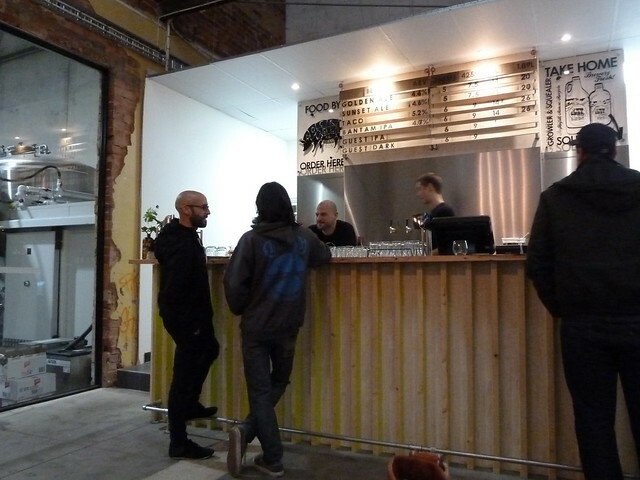 Its front yard houses the MiHUB Cafe, a social enterprise for new migrants. 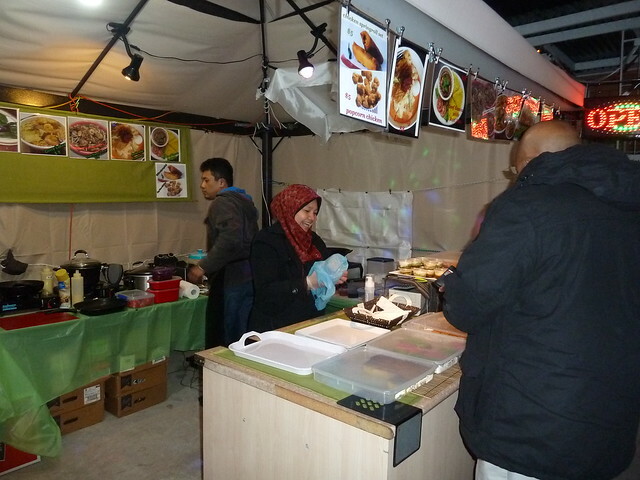 Since January the Malaysian community has been at the helm, offering hawker-style food at low, low prices. The way it works is you nab a plastic table and then go and see what takes your fancy. I had rallied Daniel and M, Bryan and Fatbee, and Jo and The Angmoh to stage a full-scale assault on the menu. When we got there, we all ran around like schoolkids, squealing and pointing at everything. 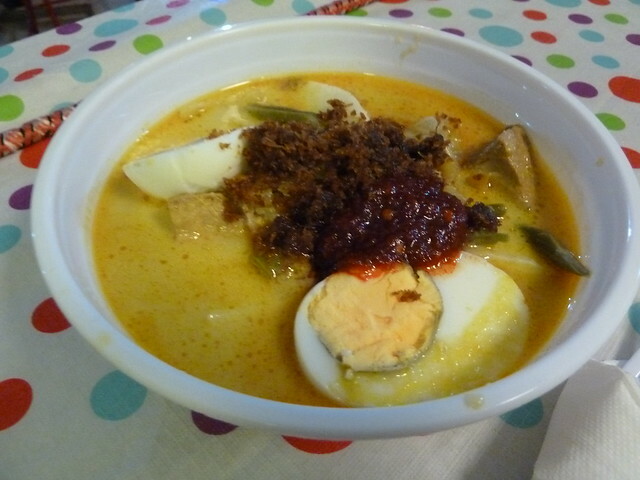 Lontong was awesome - a light, coconutty broth with hardboiled eggs, spongy tofu and more compressed rice cake. 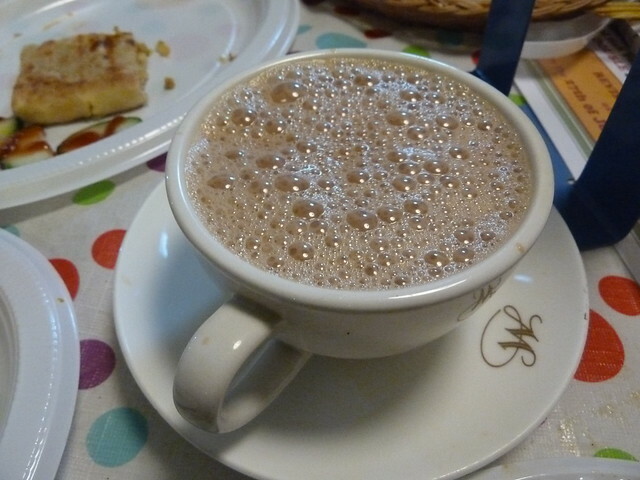 It was lukewarm, which we felt might have been authentic given the usually tropical clime in Malaysia. 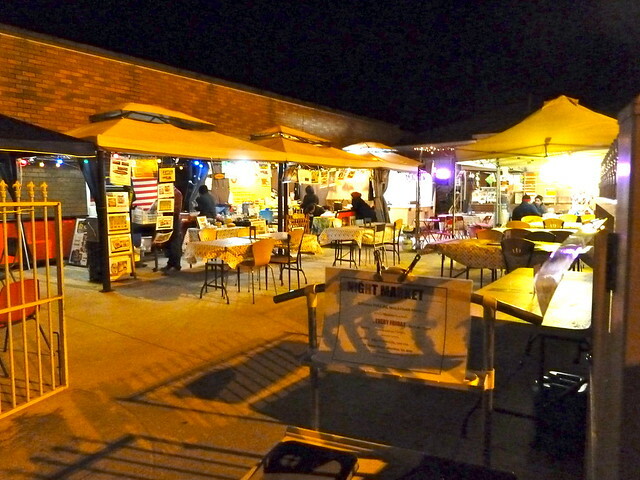 The temperature didn't translate as well to a windy night in Werribee, but the flavour was all there. 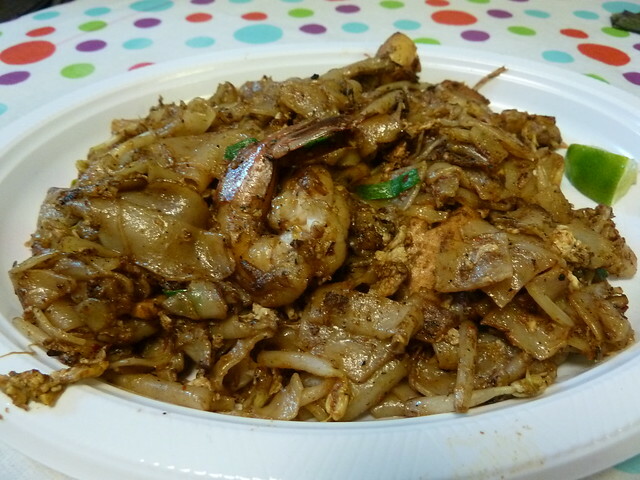 I LOVED the char kway teow, with proper smoky breath of the wok, really springy prawns and fantastic wide rice noodles. 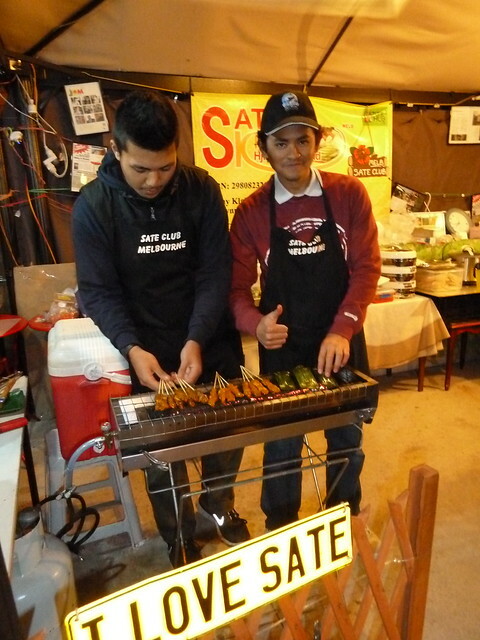 It's cooked on a gas-powered wok right under the marquee. And...only eight bucks! This is the thing I'd go all the way back for. 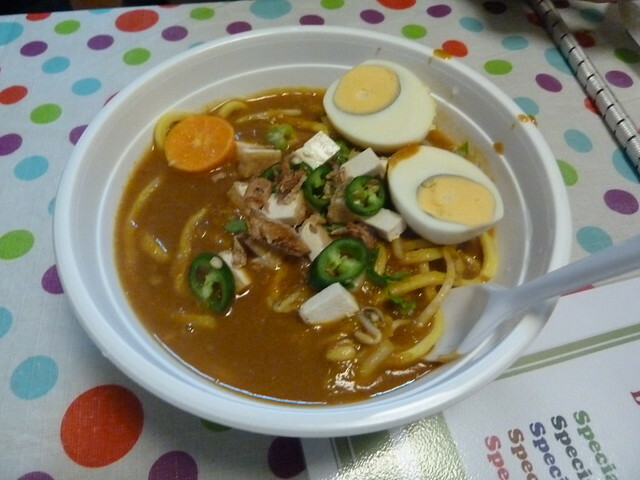 Mee rebus was a new one for me, with a thick, sweet sauce and Hokkien-style noodles. I found the sauce too sweet but Daniel reported that's how it's meant to be. 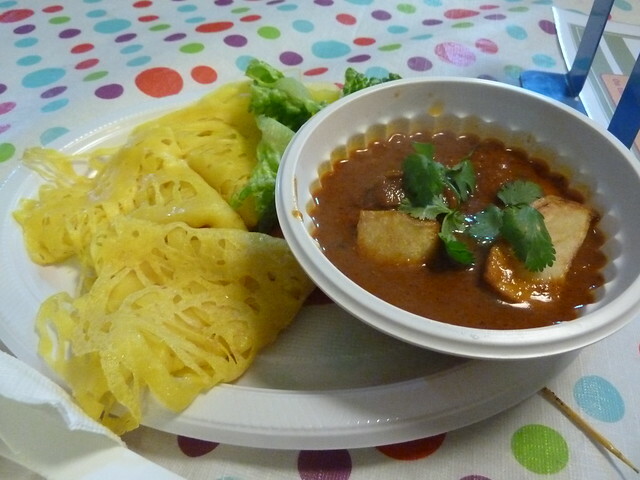 Quite liked this curry with roti jala. 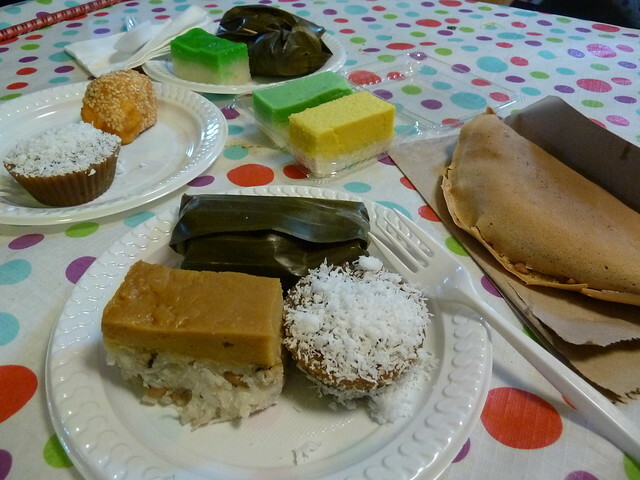 I've also had these lacy pancakes at Chilli Padi in Flemington 100 years ago, where I liked them better - I found MiHUB's a bit plain, with no crispy bits. 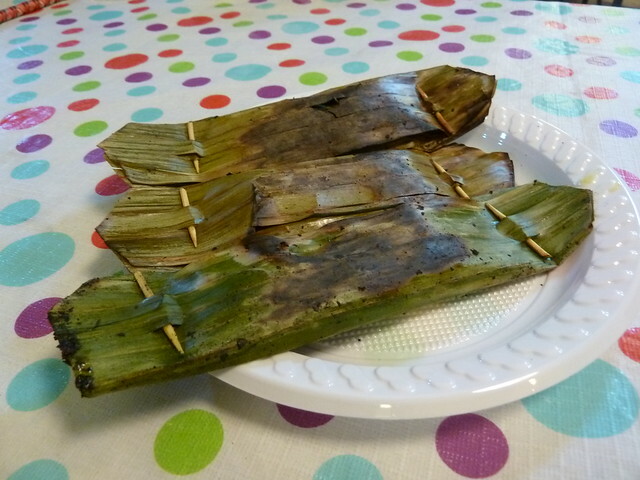 Otak otak or spiced fish mousse in banana leaf were pretty good (three for $5). You unroll them and eat the little sausage-like delight inside. 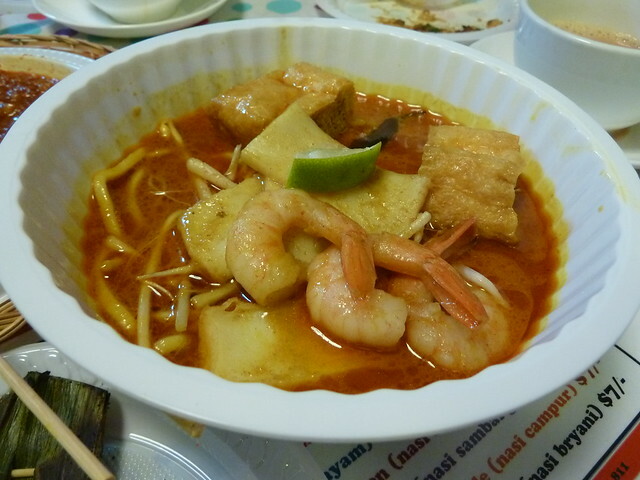 As this bowl of laksa was passed around, anyone looking above shoulder height only would have thought it was a competition about who can do the best grimace. It was very peculiar, tasting strongly of curry powder rather than the classic laksa paste-y flavours of fresh lemongrass and chilli. Give this one a miss and try something more exotic! The murtabak got a big tick from me. 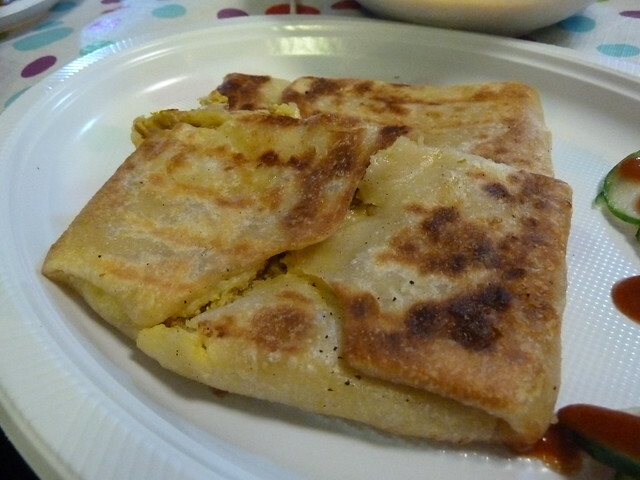 This is essentially a stuffed roti, panfried on both sides to get nice and crispy. Most times I've had it, it was just a bit nothing, but this was spicy, warm and delicious. (I can't recall the filling but I think it was lamb and spicy potato.) Oh and re the prices, I didn't write any down (too hard when trying to stuff food in mouth at top speed), but most things are eight dollars. YES. EIGHT DOLLARS. Finally, we raided the dessert selection. A lot of these sweets suffered from being served in the frigid conditions - they would have been a lot softer and more delicate in 30-degree heat, rather than 10. The best was the yellow fellow in the middle, which had a layer of durian-flavoured custard over some kind of sticky rice. Super-sleuth reader Sukie reported that the best times to go are Friday night and Sunday brunch. (Maybe do proceed with caution though in terms of Sundays for the rest of Ramadan, as many observant Muslims will be fasting during daylight hours, so the cafe's hours or offerings could be limited. Just me speculating but it might save you a fruitless trip! Give them a call on the number below perhaps to check.) Do get in quick as there's no telling when the space will rotate to another community group. In the end, the wind got so fierce we had to leave, so worried we were that our marquee was about to take off Wizard of Oz-style and whisk us away to Penang. Actually, now that I think about it - and the problem with that was...? PS: You can also check out Bryan's wrap of the night right here!